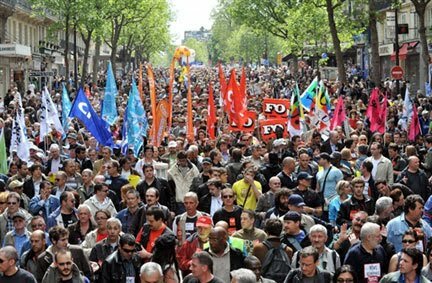 Workers in Paris join in massive May Day demonstration. Photo from AFP. Those who proclaimed May Day as the workers’ day over a hundred years ago understood the need for global solidarity to achieve justice. This was a week of worker militancy. Wednesday, April 28, in large cities and small towns, workers rallied in support of improved health and safety at the workplace. [See "Austin Construction Workers: No los Vamos a Olvidar'" by Alice Embree.] This was the fortieth anniversary of the establishment of the Occupational Health and Safety Administration. In the minds and hearts of these workers were the recent deaths in mines in West Virginia and Kentucky and oil rigs in the Gulf of Mexico. On April 29 masses of workers assembled, thousands in Manhattan, to protest Wall Street’s robbery of the American people, particularly for its creation of an economic crisis that has cost workers all over the globe millions of jobs. And finally on Saturday, May 1, the international day of workers’ solidarity, inspired by the protests in support of the eight-hour day movement in Chicago in 1886, millions of workers mobilized everywhere; from Hong Kong, Istanbul, Athens, Berlin, Hamburg, Manila, Moscow, Seoul, Tokyo Taiwan, Bangkok, to Havana. In the United States huge throngs marched in support of immigrant rights in Los Angeles, San Francisco, Chicago, New York, Dallas, Austin, and many other cities. I just finished teaching a course called “The Politics of Capital and Labor in the United States.” We read texts that analyzed the development of capitalism as the dominant mode of production. We discussed its various stages from competitive to monopoly capitalism to today’s era of finance capital. I highlighted the post-World War II period in U.S. and world history emphasizing the establishment of a permanent war economy, deindustrialization, financialization, and neo-liberal globalization. We then concentrated on the changing nature of the circumstances of work and workers over the last 60 years drawing upon the collection from Dollars and Sense magazine called "Real World Labor." By way of summary, I prepared a list of the impacts of systemic economic and political changes on workers derived from the various essays in the book. The list, in no particular order, suggests the ways in which the lives of workers have been transformed over the last 60 years and why the mass mobilizations of workers, such as those this week, are so desperately needed. The list only touches the surface. It includes dramatic increases in state and employer mechanisms to obstruct union organizing. Union density in the United States has declined from a peak of 33% in the early 1950s to 15% today (half in the public sector). Employers skillfully use workplace policies to destroy the potential for worker solidarity, from encouraging racism, and inter-ethnic hostilities, to creating two-tier salary schedules. Work has been increasingly sub-contracted and outsourced, shifting manufacturing and service employment from once higher paid industrial capitalist countries to poor countries whose traditional economies have been disrupted to accommodate new factories of outsourced work. Sweatshops, initiated in textile mills in Britain and the United States 200 years ago, began to be transferred to countries of the Global South in the 1960s and now, with declining real wages in the United States, are returning to domestic venues. For those with jobs, whether in manufacturing or service, modern forms of Taylorism are imposed on work processes. Originally Taylorism inspired efforts to control all the physical movements of workers to maximize their productivity at all costs. Now such techniques are applied in the service sector as well, programming what workers say to customers and the appropriate physical space prescribed for interactions with them. Generally, techniques have been created to maximize the productivity (but not wages) with which all work is performed. Workplace harassment has been rising in recent years, including demeaning treatment of workers, targeting workers with seniority so that they will be forced to retire, and encouraging racism and sexism on the job. Similarly, the initiating of workplace regulations in the past has been reversed. Taking occupational health and safety as an example, systems of rules, regulations, and inspections led to a significant decline in workplace deaths and injuries during the 1970s. Those changes that benefited workers have been reversed since the 1980s. It is estimated that a shop floor or workplace can be expected to be inspected only once every 83 years. The tragedies in mines and on oil rigs this year remind workers that their jobs have become as dangerous again as they were 50 years ago. And of course real wages, benefits, and jobs have all declined. Economists still debate what should be the “natural unemployment rate.” Everywhere, from U.S. cities to most of Latin America, Africa, Asia, and the Middle East, life-sustaining remunerative activities involve creative street hustling, what economists call “the informal sector.” Good paying secure jobs -- as a percentage of all the work in the world -- are declining. In factories and service jobs “wage theft” has become common; that is, employers find ways to avoid paying workers what they have earned. State policies have enforced increasing exploitation of workers. Old fashioned repression, that is using the police and armies to crush union-organizing drives, occurs from time to time. In the United States, business lobbyists pressure state legislatures to pass “right to work” legislation limiting the ability of workers to form unions. Dilatory procedures for certifying union recognition, impediments to elections, prohibitions on strikes, and administrative decisions to prohibit categories of workers from unionizing have become instruments of state policy. Of course, in every country where organizing campaigns occur, leaders are targeted for dismissal and sometimes death squads. In addition to this modest list, the transforming global economy has created millions of migrant workers who are forced out of their jobs and from their land to become a pool of reserve workers who desperately seek work in other countries. Masses of Latin Americans come to the United States to find low paying jobs while they are threatened by state repression, most immediately illustrated by the new draconian Arizona law. Mobility also occurs from and to countries of the Global South. A million Bolivians have migrated since 1999 to work in sweatshops in neighborhoods of Buenos Aries, thousands of Nicaraguans pick pineapples in neighboring Costa Rica, and Central Americans work in Mexican factories. So this week workers everywhere were on the move. Their campaigns and rallies are about worker rights, jobs, benefits, and the capacity to be treated, wherever they live, with human dignity. The annual May Day events suggest that workers’ struggles are truly global. Capitalism in the era of neo-liberal globalization is truly global and in the end organization and resistance must be global. Those who proclaimed May Day as the workers’ day over a hundred years ago understood the need for global solidarity to achieve justice. Workers need to build off this week’s dynamism to create a movement of global solidarity.